Since Pluto fell out of favor as a planet (being demoted to a dwarf planet) scientists are eager to find a ninth planet that could fill the gap Pluto left behind. Could the object spotted in the far reaches of our solar system be it? “Amazing” indeed as the team has calculated this planet would be up to 10 times the mass of Earth or about three times its size–that makes it a super-Earth or mini-Neptune! 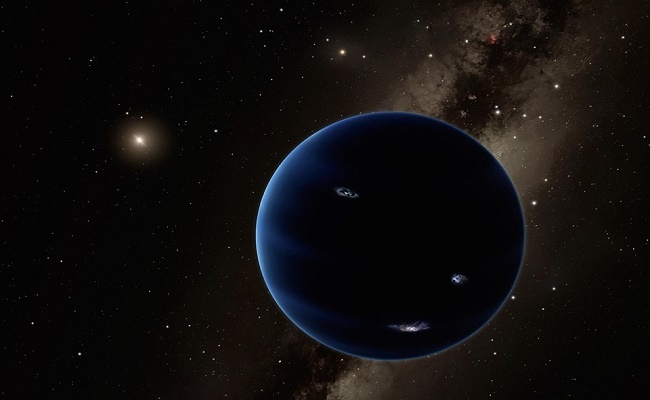 Wikipedia Ninth Planet artist conception. When a team stumbled upon an object in 2014 now called 2012VP113, or Biden, the new world’s orbit was similar to Sedna (also discovered beyond Pluto) as in they both made unusual paths around the sun. This suggests that another distant object must be sculpting the orbits of these and other distant worlds. Batygin and his Caltech colleague Mike Brown began to take a closer look at these particular astronomical wonders (six in fact) to see if the orbits of the worlds could occur simply by chance. To that theory, the scientists gave it a fat chance. “That probability clocks in at a whopping 0.007 percent,” Batygin says. This information then lead the team to simulate the outer solar system to try to figure out how to generate the observed patterns. The Kuiper Belt was soon ruled out, which could only mean that there is one single cosmic sculptor responsible for the odd orbits. With this new evidence coming to light, researchers were more and more convinced of the presence of a Ninth Planet. So if this elusive Ninth Planet does exist, how are they going to find it? According to Laughlin; “this thing will be faint. Like, crazy faint.” In fact, the researchers are estimating it to be around 10,000 times dimmer than Pluto, so locating any heat signatures by current surveys has not been successful, nor will it reflect much sunlight. That means astronomers searching for it not only need to use incredibly powerful telescopes, they need to know where to look–kind of like finding a cosmic needlepoint of light in a vast haystack of stars. Although the team has their work cut out for them, they are determined to find this possible Ninth Planet. Whether it turns out to be our next Pluto is still to be determined, but so far things are looking bright. Name a star now! - Planet Nine Discovered?